Did you know that the average mattress lasts about nine years? The nine-year figure does not mean a mattress necessarily fell into disrepair, but the owner decided to move on because sleeping preferences changed or a newer model offered more features. Nine years is a long time, especially if you think about the average time we drive the same vehicle. Mattress manufacturers understand the importance consumers place on buying the right mattress and in recent years, many mattress manufacturers have developed cutting-edge technologies that enhance the quality of sleep. From coils that independently move into the most effective contouring positions to manufacturers offering different levels of layer thickness for the same brand of mattress, consumers never had more options to ensure high-quality sleep every night. Two mattress manufacturers tout eco-friendly mattresses that go well beyond the green movement. Bear promotes its mattresses for consumers who enjoy active lifestyles. On the other hand, Loom & Leaf specializes in designing and manufacturing mattresses that appeal to a certain segment of consumers. We performed extensive research into both signature mattresses and concluded one of the mattresses outperforms the other mattress. Let’s find out which mattress rules supreme in this comparison article. If you asked a small group of consumers which factors play the most integral role in making a mattress buying decision, chances are you would receive several different answers. However, we like to make safe bets and for mattress buying factors, we predict comfort would appear on many consumer lists. After all, comfort, whether you define it by firmness level or lack of motion transfer, is the one factor that determines the quality of your sleep. However, what you think is comfortable for a mattress might not even cross the mind of the person standing next to you at a bedding store. We list five important factors for buying a mattress, with comfort representing the first factor that should appear on your list. Comfort encompasses several mattress attributes: firmness, temperature, edge support, motion transfer, and pressure point relief. If you experience pain in the neck and upper back, then a mattress that gently contours the sensitive pressure points is your ideal definition of comfort. On the other hand, your partner prefers a very firm mattress that delivers unsurpassed support for the hips and lower back. Do we have a comfort dilemma for two people sleeping on the same mattress? Not anymore, as a growing number of mattress manufacturers have come to realize what is one person’s definition of comfort is a partner’s definition of pain in the neck. The solution to the comfort definition differences is to design larger mattress to include two distinct areas of the mattress that deliver two different types of comfort. Other comfort factors appeal to different sleeping demographics as well. Side sleepers want edge support, while stomach sleepers at the middle of a mattress do not want much sinkage. We just mentioned two of the three primary ways people fall to sleep: side and stomach sleepers. Toss in back sleepers and we complete the sleeping position trifecta. Seems simple enough, until you account for the dozens of subtle sleeping styles found within each of the three sleeping position categories. For example, a side sleeper that places an arm under the head has a much different mattress preference than a side sleeper that curls up at night with legs tucked in near the chest. Moreover, asking consumers about their preferred sleeping positions is a bit of a trick question. Most of us start out in one sleeping position, only to wake up hours later in a completely different sleeping position. Many mattresses manufacturers customize twin and full mattresses to include an extra large option. The extra wide twin and full mattresses accommodate rapidly growing adolescents that require more sleeping room within a few years. We encourage most adults to start searching for mattresses in the queen size range. Mattress size has much more to do with width and with a Queen or above size mattress, you enjoy a spacious mattress that easily sleeps you and your partner. Even if you sleep solo now, you never know when you will gains a sleeping co-pilot. Larger mattresses are also recommended for sleepers that move around during sleep. You might start out the night on your side benefiting from firm edge support, but eventually, you end up in the middle of the mattress to sink into sleep on top of plush memory foam. You might have heard about the terms sleeping “hot” and sleeping “cool.” What exactly does that mean? It means our bodies go through different subtle temperature ranges throughout the night. The transition from light sleep to deep sleep has the most impact on body temperature because we generate a lot of energy making the move into dreamland. Mattress manufacturers use liquid gel foam mattresses to create a cooling effect for sleepers that warm up at night. Conversely, if you sleep cooler than average, you can find a mattress designed to trap body heat at the point where a foundation layer meets a transitional layer. Poorly designed mattresses can cause acute neck, back, hip, and shoulder pain. Super soft mattresses designed for the wrong customer can set off pressure point pain and very firm mattresses can exacerbate upper back pain if not designed correctly. Pain management for mattress makers recently went through a revolutionary phase of design. You can find mattresses that not only prevent pain but also reduce any pain you experience before lying down on a mattress. Manufacturers custom design mattresses to attack pressure point pain at the direct point of flare-ups. In addition to alleviating pain, high-quality mattresses also prevent allergens from turning a night of sleep into sneeze fest. As a bed in a box company, Bear mattress targets consumers that engage in active lifestyles. Bear promotes it mattress as the perfect solution to allow active customers to recover from physical activities. By using a bear as the image for the company, a Bear mattress conjures up images of the large animal comfortably sleeping another winter away. The advanced cover and graphite gel infused memory foam are the one-two comfort punch Bear emphasizes to customers. Designed with patented Celliant infrared yarn technology, Bear mattresses have undergone several clinical trials to prove the mattresses quickly restore oxygen levels for customers that work and play hard all day long. The Bear mattress features four memory foam layers that increase in firmness level from the top cover layer to the bottom foundation layer. We typically give mattress covers a separate section, but for the Bear mattress, the cover does not warrant a different comparison section. Bear promotes the cover as the first layer and although the cover is super soft, there is not enough material to maximize the benefits of the comfortable and highly breathable first layer. Celliant supposedly turns body heat into infrared heat to increase oxygen flow and hence, help cool the body during the transition from light to REM sleep. Results of Bear mattress test do not conclusively prove the company’s Celliant claims. However, it is a relatively new technology that deserves additional tests to form an accurate analysis. One and a half inches of graphite-infused memory foam forms the true top layer of the Bear mattress. With a density of four pounds, the second layer effectively relieves pressure, as well as regulates body temperature to prevent uncomfortable overheating. Unlike the Celliant designed cover, the top layer has undergone numerous tests that confirm the ability of the top layer to quickly respond to pressure points over a wide variety of temperatures. Two response layers form the transition between the top layer and foundation layer. Each response layer measures one-inch thick to deliver a small amount of bounce that does not produce much if any motion transfer. Both response layers quickly turn sinkage into former body impressions. Nearly seven inches of polyester foam comprises the base layer. The firm support is a nice complement to the softer layers located above. We consider the design of the Bear mattress foundation layer to be a standard foundation layer design. Different body sizes and weights lead to different experiences consumers get when lying down on any type of mattress. The Bear mattress works great for active customers, but it also does a great job of providing support in the middle of the mattress. Users with above average body weights will experience initial sinkage that quickly rebounds to appear like the mattress was never slept on. Most testers call the Bear mattress medium in the firmness range, which runs from a low of one to a high of 10. Medium firmness puts the Beat mattress at about the average level of firmness for any style of mattress. Gel memory foam delivers the soft contouring that gently caresses aching joints and muscles. After smooth contouring, you should begin to feel the rebound power of the foundation layer. The bounce you feel is the change from super soft contouring to medium firm support. Memory foam mattresses do not enjoy a positive reputation for producing adequate edge support. However, the Bear mattress defies conventional wisdom by providing above average edge support, which is a positive trait side sleepers seek in a mattress. If you start a night’s sleep at the side of a mattress, you should love the firm edge support provided by the Bear mattress. The level of edge support rivals what you find with an innerspring mattress. You can be confident the above average edge support will prevent you from rolling out of bed when you change sleeping positions near the side of the mattress. Bear runs several discount promotions through bedding review websites. On its website, Bear typically offers at least one special for first-time customers, as well as deeper discounts for returning customers. You typically need to type in a promotional code to receive one of the discounts offered by Bear. gives needy children the apparel and equipment they want to play sports and enjoy outdoor recreational activities such as camping and hiking. 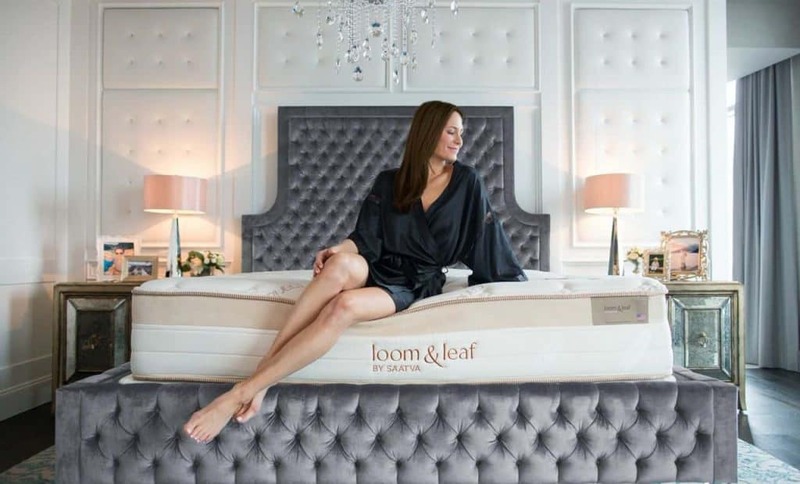 World-renowned mattress manufacturer Saatva decided to enter the luxury mattress market by introducing the Loom & Leaf mattress. The luxury mattress contains high-density foam that delivers optimal comfort and support. 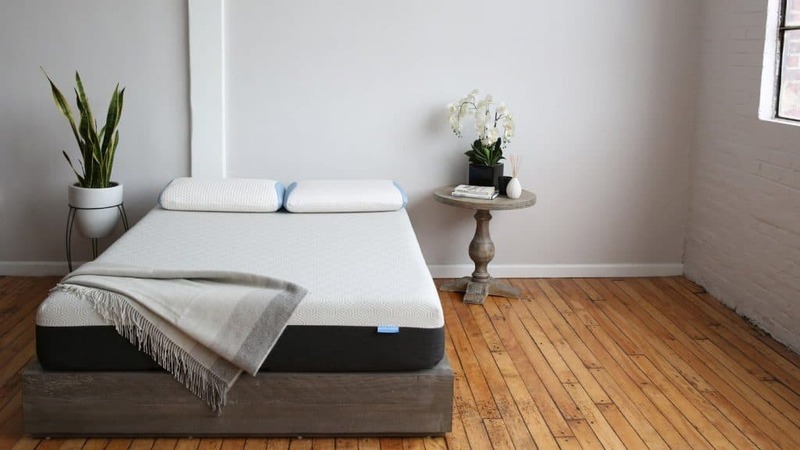 By introducing the Loom & Leaf mattress, Saatva also entered the eco-friendly mattress market by using sustainable materials to design each layer of memory foam. Four different layers deliver 12 inches of support for the Loom & Leaf mattress. Unlike Bear, Loom & Leaf does not consider the cover to be one of the four layers. The first layer spans two inches of gel infused memory foam, which ensures hot sleepers never toss and turn because of the accumulation of perspiration. If you generate body heat during the transition from light to deep sleep, the cooling gel panel immediately restores optimal comfort to your sleeping experience. The top layer includes air channels that push cool air through the foam and up onto your body. 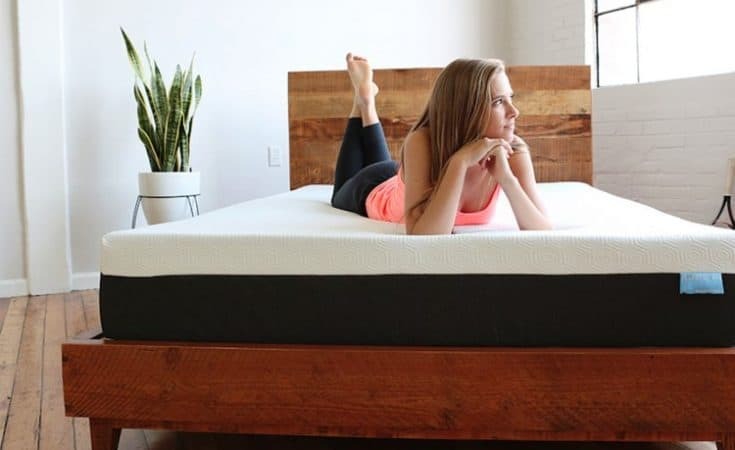 Loom & Leaf has designed the second layer with two and a half inches of visco-elastic memory foam that contours the body by supporting the first layer. We have discussed the first two layers and we have not reached the halfway point in thickness for the Loom & Leaf mattress. The transitional layer contains two inches of memory foam to limit sinkage, especially at the center of the mattress. During the recovery by the top two layers, you should feel little, if any motion transfer. At more than five inches thick, the base layer provides uncompromising support for back sleepers that need firmness to relieve pressure points. Loom & Leaf mattresses offer a tangible cover that helps lull users into a comfortable sleep. Saatva added 5/8 inches of foam inside the cover to produce a padding effect that works well with the contouring delivered by the first layer. Quilted organic cotton boosts the breathability offered by the top layer. Since 2016, Saatva has designed the Loom & Leaf cover to generate tighter feet to prevent uncomfortable fabric bunching. With two firmness options, Loom & Leaf offers customers flexibility in how they want to sleep. In fact, you can buy the plush support provided by one mattress and then turn to the firmer mattress to enjoy solid back support as you grow older. The standard Loom & Leaf mattress measures 5.5 on the firmness scale, while the firmer mattress option produces a firmness rating of 8. If you want to prevent back pain or reduce the amount of pain felt in the lower back, the firmer Loom & Leaf mattress is for you. The combination of four layers measuring 12 inches thick puts the Loom & Leaf in rarefied mattress quality air. Saatva ensures a soft landing on the mattress, with a quick recovery firming up the sleeping experience. The lack of motion transfer for the Loom & Leaf mattress makes it ideal for couples that sleep in different positions throughout the night. We read several bedding expert reviews and conclude the Loom & Leaf mattress has raised the quality bar in terms of providing superior support. If you added about $100 to every mattress size offered by Saatva, you would create the price points for the Loom & Leaf line of luxury mattresses. The high-end organic cotton and gel-infused memory foam pushed the price of a California king to $1,499. We have compared other mattresses that cost much more and the mattresses are not close to the quality offered by the Loom & Leaf mattress. The 15-year warranty is more than the length of the warranty offered by Bear and the free home trial period runs for 120 days. If price determined the winner between the Bear and Loom & Leaf mattresses, then Bear would come out ahead in the comparison. Nonetheless, we firmly believe the price should be considered the tiebreaker when comparing mattresses, not the sole buying factor. 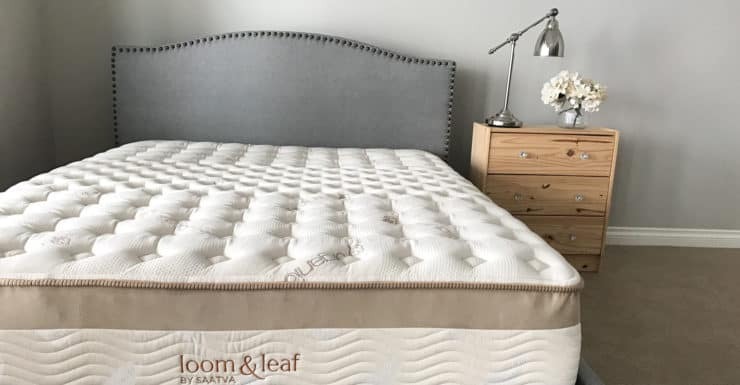 Although Loom & Leaf mattresses cost more than what Bear charges for its mattress, the price points offered by Loom & Leaf are much lower than the price points attached to inferior mattresses. You enjoy sleeping on a mattress that delivers superior comfort by ensuring every pressure point receives gentle contouring. Loom & Leaf has designed a luxury mattress for the ages, and the mattress destroys the Bear mattress in a one-on-one comparison. The first tips for buying a mattress involve doing your homework. Factory direct mattress manufacturers offer generous free home trials because you do not have the opportunity to test most brands at bedding retailer outlets. If you shop for a mattress direct from a factory, make sure to read online customer reviews and bedding expert analysis. 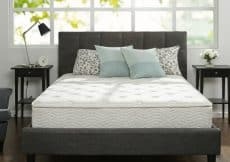 Customer reviews provide you with an overview of what to expect from a mattress, while bedding expert research delves deeper into the technical features that define each mattress under consideration. Our comparison articles offer you in-depth insight into two different mattress brands. A mattress might not seem like the kind of purchase that screams “Haggle until the sales rep gives in,” but with mattresses like Loom & Leaf running more than $1,000, a skilled negotiator can save at least save several hundred dollars. You can offer cash for a mattress purchase, as long as the manufacturer knocks a few hundred bucks from the suggested retail price. Many mattress manufacturers are open to bundling bedding accessories to motivate consumers to make mattress purchases. For example, you might receive an offer of a free pair of pillows and a set of smooth sheets to get you to close the deal. You do not have to sign a legally binding contract when you buy a mattress, but you do have to read the sales agreement to ensure you enjoy a favorable warranty and a customer-friendly refund policy. Most mattress warranties run between 10 and 25 years. You need to confirm the length of a mattress warranty, as well as ensure the manufacturer has not added restrictions to cash in on a warranty. Review the refund policy to determine whether the manufacturer offers a full cash refund or requires you to use a refund to purchase another mattress designed and manufactured by the company. Some mattress companies hide a 15% restocking fee for returned bedding products. What Happens on Delivery Day? The delivery day represents the final step in buying the mattress of your dreams. Most mattress manufacturers off free shipping, but that does not mean your new mattress will arrive in mint condition. From rips and tears caused during transport to clumsy handling that leads to a dirty fabric, you have to inspect the mattress upon arrival to your home. You also need to verify the mattress company did not tack on unexpected shipping charges, such as a fee for delivering a mattress above a specified weight. Search for a label that reads “All new materials” to confirm you are receiving a mattress no one else has ever owned. If you experience any issues with your new mattress, immediately contact the company’s customer service department to seek a resolution. Lull vs Nectar Compared: Which is Right for You? 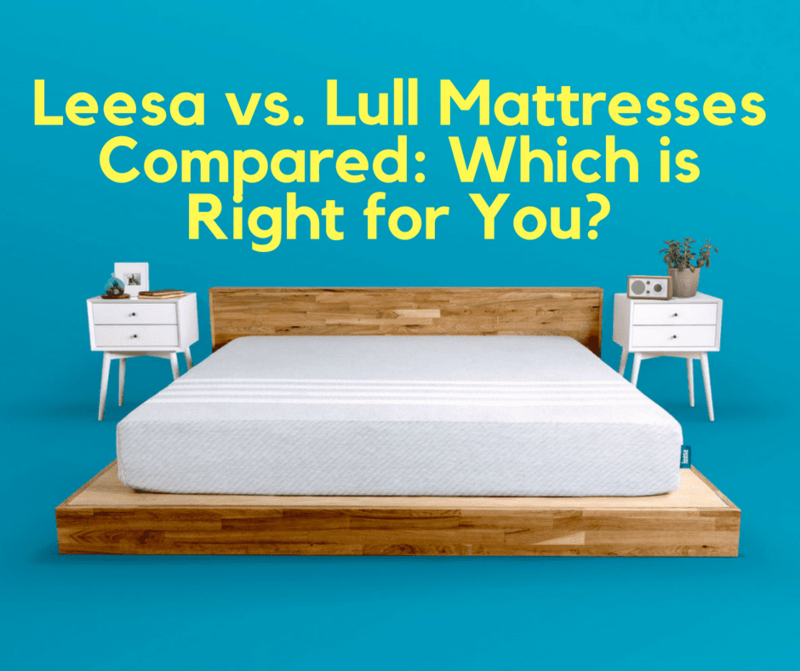 Leesa vs. Lull Mattresses: Which Will You Love the Most?